20 -- Hank Foiles, catcher, watch). X-10: Ted Kluszewski at bat in fourth inning. Makes hit and overruled by umpire over first base line. X-11: Duke Snider hits. X-12: Foiles safe at second on hit by Pirate pitcher when Zimmer dropped ball. C: Virdon slides into second base safe under tag of Charlie Neal (43). D: Attempted steal by Cimoli into second base in sixth inning. Groat (24) made the tag. 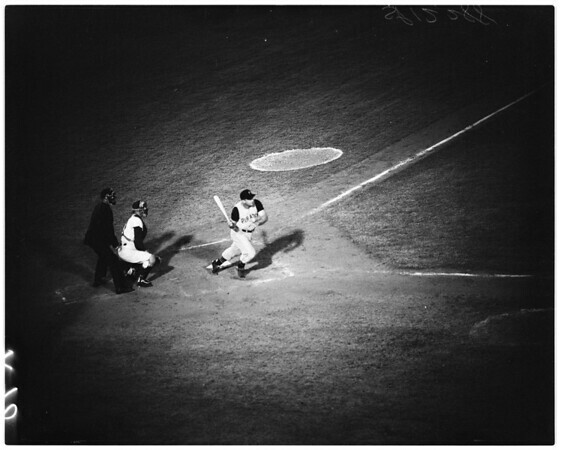 X-13: Clemente runs past Al Walker for the sixth Pittsburgh run, eighth inning".